The SD Association has released the name and official specifications for SD Express, the latest Secure Digital (SD) memory card format, as part of its SD 7.0 specification. Created as a successor to UHS-III cards, SD Express is next-next-gen interface technology that will work alongside a new SDUC card type to provide fast, high-capacity memory cards in a familiar package. As the name suggests, SD Express cards are going to be fast. 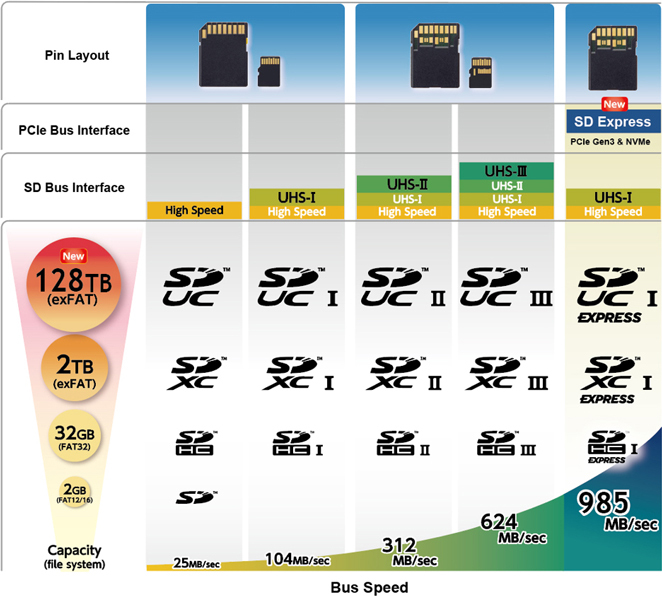 The SD Express format uses third-gen PCIe and NVMe transfer protocols on top of the dual-level pin layout interface to offer a theoretical maximum transfer speed of 985MB per second—almost a gigabyte per second and roughly 1.5 times faster than the maximum promised by the UHS-III cards that are only just starting to hit the market. In order to achieve the maximum transfer speed of SD Express cards, you’ll need a camera or device that supports the new format as well. If, once these cards arrive, you end up sticking your brand new SD Express card inside your 5D Mark III, it’ll simply fall back to the speed of an (already outdated) UHS-I card. SD Express cards will be available in SDHC (High Capacity) and SDXC (Extended Capacity), as well as an all-new SDUC (Ultra Capacity) format. The new SDUC cards will have a maximum storage capacity of 128TB, a large leap from the (as yet unreached) maximum 2TB capacity of SDXC cards. Infographic provided by the SD Association that details the various specs and classifications of different SD cards. So yes, you could have a UHS-II, U3, SDUC card, if you really like the letter U. It also appears as though it’ll be possible for memory card manufacturers to make SDUC cards for slower SD bus interfaces. So, according to the above graphic, you could theoretically have a 128TB “High Speed” SD card. With a little back-of-the-napkin math, that means it would take at least 59 and a quarter days to transfer all 128TB of the card, in the incredibly unlikely event of it maintaining its maximum read speed of 25MB per second for the whole duration. To find out more and read more details about the SD Express and SDUC formats, be sure to check out the SD Association’s press release. The SD Association has also released a white paper detailing the new capabilities and features found in the SD 7.0 specifications if you’re interested in really digging deep.